The lovely team at Hotel Chocolat gave me the option of reviewing some chocolate for Father's Day or giving some away to a lucky reader. As I was feeling generous and thought you guys deserve a chance of winning a special treat I decided to run the competition. If you haven't tried Hotel Chocolat before you can read or review of some of their Christmas Chocolates here. They are a firm favourite for me now! 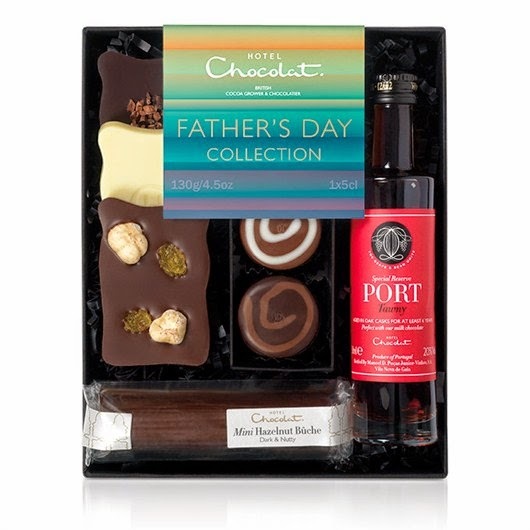 Right so the prize is this rather fabby Hotel Chocolat Father's Day Collection set worth £15. All you have to do is follow the instructions on the rafflecopter form below. Open to UK only. The competition will end 07/06/2014 at 12am. All entrants must complete the mandatory entry on the rafflecopter form. Those who don't will have all entries removed. The blog owner will choose the winner through the rafflecopter form (which uses random.org) The winner will be notified by email and displayed on the widget. One winner will receive a Father's Day Collection box. No alternative prize will be offered. Please allow up to 28 days for delivery of prize. We can't guarantee delivery in time for Father's Day but will do our best to get it to you in time. My family are Diary Milk fiends, so a box of Hotel Chocolat would be a welcome lesson for them! Cadburys mostly...and hotel chocolate on special occasions...! Mmm chocolate, if its choccie I'll eat it! Doesnt matter what kind! Cant beat a terrys orange! Was lucky enough to get a Hotel Chocolat Easter gift and the caramel chocolate is divine! Really bitter dark chocolate for me. milk chocolate with nuts in! Hubby's favourite is chocolate covered peanuts. Milk Chocolate, Dark Chocoltate, White Chocolate, Chocolate orange, any chocolate really!!!! Milk chocolate, thanks for the yummy giveaway. Dark chocolate, especially dark chocolate with mint. All chocolate is good except the dead cheap kinds. Its all my fave. The darker the better. And it must be Fairtrade and organic of course. A good slab of Dairy Milk. Orange milk chocolate. I always pick them out of a selection box. Nothing too posh but nothing too cheap, Thorntons, Cadburys, Galaxy....all good stuff! Milk chocolate with nuts in. terry's chocolate orange for me. Got to be milk, yum! Has to be Terrys Chocolate Orange.